Hellma Cuvettes (Cells) are manufactured from various types of glass. The most important criterion for the choice of a particular type of glass is the spectral range for which the cuvette is intended. Coloured logos are fused onto each Hellma Analytics cuvette, thus indicating the spectral range over which the Cuvettes can be used. In general the glass materials that is used is divided into two groups: quartz and optical glass. 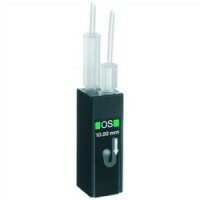 Quartz displays a high UV transmission, in highly purified synthetic quartz down to well below 200 nm. The thermal expansion of quartz is extremely low, its coefficient of thermal expansion being 6 x 10-7K-1 between 20 °C and 300 °C. Quartz is chemically very resistant and maintains its shape, even at high temperatures up to approximately 1000 °C. That they display good resistance to chemicals. 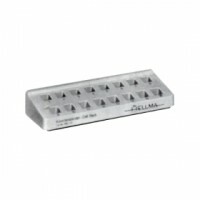 Hellma Absorption Cells, Cells for Flow-Through Measurements- compact, with 2 screw connectors M 6 x..
Recertifying Didymium Glass Filter 666-F7W for checking wavelength accuracy..
Recertifying Glass Filter Set 666-S002 (F2, F3, F4) for checking photometric accuracy.. 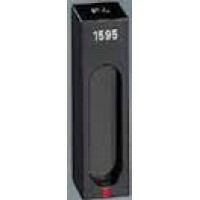 Polypropylene cell stand for 16 cells with 10 mm light path, Dimensions (L x W x H): 210 mm x 70 mm ..